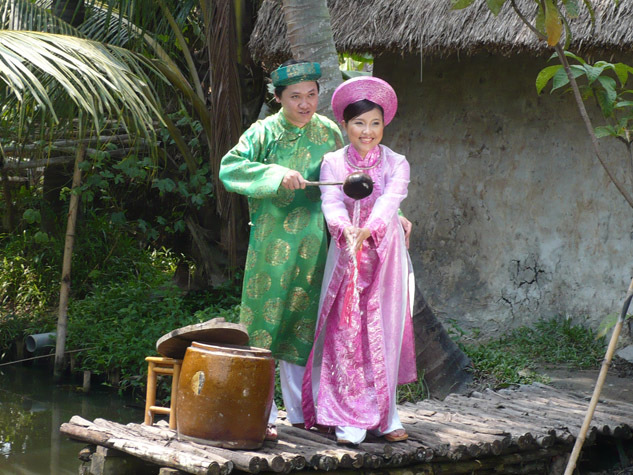 Vietnam is rich in Culture and Tradition and you will come home with some lifelong memories of your travels. Bring a little Vietnam home to share with family. Have you ever found yourself in the situation where you are hurrying around the shopping centres in search of inexpensive souvenirs for friends and family on the last few hours of your holiday. This was me but no more, thanks to the “Note” app on my iPhone. Souvenir shopping need not be a chore if you begin a list of names who you want to buy for and some souvenir ideas. Be on the look out for souvenirs on day 1 and add the item next to a name as you buy it. So simple but amazing how much more enjoyable it makes your holiday time knowing that you have things under control. Here are some of my favourite inexpensive souvenir ideas. 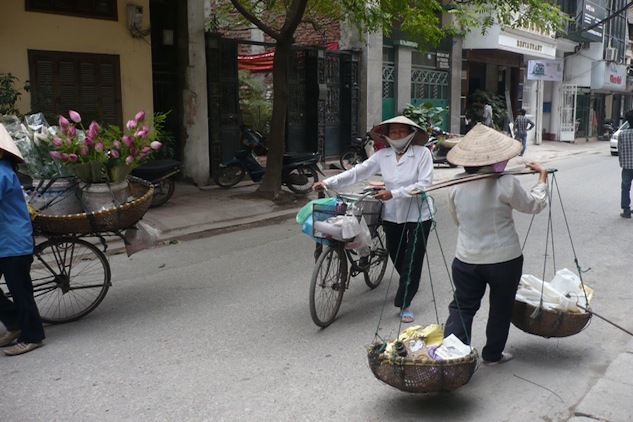 Non La A Non La is the traditional Vietnamese conical hat that you will see all over Vietnam. They are hand made from palm leaves and bamboo and are available in markets everywhere for a few dollars. Maybe not a bad idea to wear while out on a day tour as the tropical sun in Vietnam has got a bite to it. Silk fabric is available in countless colours and beautiful designs. It is of high quality and you could spend hours looking through all that is on offer. 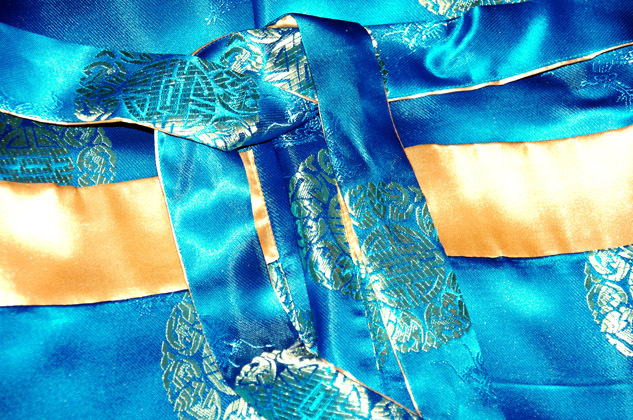 You can find Silk fabric in Street Markets, Tailor shops and the larger under cover Markets. Ben Thanh Market in Ho Chi Minh City has a huge range in many stalls and English speaking staff. Tan Dinh Market in District 1 has more but little to no English is spoken as it is wholesale style market catering mainly to local traders. Don’t be put off by the lack of English as the traders use a calculator and body language to communicate their price. So if you are feeling adventurous go out and enjoy the haggle. After all, the goal is to buy some Vietnamese Silk Fabric at a great price. An “Ao Dai” (pronounced “ow” as in cow Yay. Ow Yay) is Vietnam’s Traditional dress. Usually a colourful, tight fitting silk top worn over contrasting silk pants. It is most commonly thought of as only a dress for girls and women but Vietnamese men usually wear an Ao Dai on their wedding day and special occasions. You can have an Ao Dai made in 24 hours at any of the hundreds of Tailor shops found everywhere in Vietnam. When buying tailored clothes I would recommend doing business with an established shop who are happy to provide basic business practice such as a receipt for your deposit. 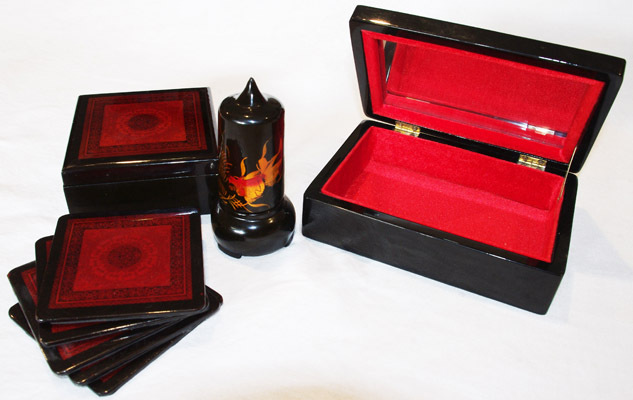 Vietnamese Lacquer ware is really popular with overseas tourists because it is relatively small and light weight. It is distinctively Vietnamese and is quite beautiful. There are different grades of lacquer ware depending on where you buy. The better the quality the higher the price. Having said that, it is still an inexpensive souvenir and won’t break the bank. In Vietnam, painting on silk is very popular and Vietnamese artists have developed some unique techniques to create artworks that capture the essence of Vietnam. Of course the paintings you buy at the markets are inexpensive but they make great souvenirs. Take a look in the art galleries around Ho Chi Minh City and Hanoi for works by Vietnam’s famous Silk Painters. Dang Tin Tuong and Nguyen Phan Chanh. 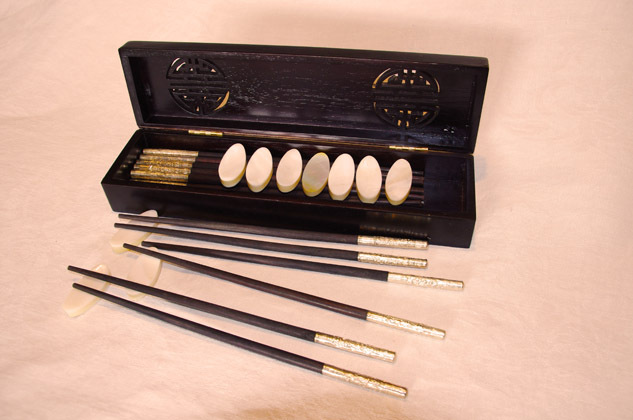 You will find Chop Sticks in decorative boxes in the souvenir shops along Le Loi Street in Ho Chi Minh City, the Ben Thanh Market, Saigon Square and Pham Ngu Lao Street. In Hanoi you will find all the same souvenirs in the Old Quarter. Take care to check the quality as there is lots of cheaper products all over Vietnam. 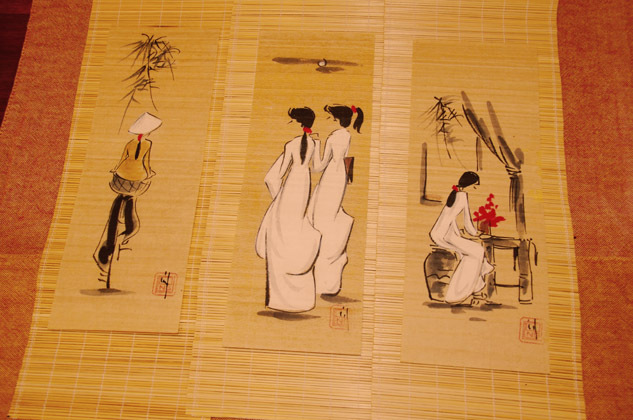 Bamboo and Paper paintings display traditional themes unique to ancient Vietnamese Culture. These simple designs capture the essence of this beautiful country and are a perfect souvenir. They are only a few dollars and easy to roll up and pack in your suitcase. These paintings are available in tourist destinations all over Vietnam. 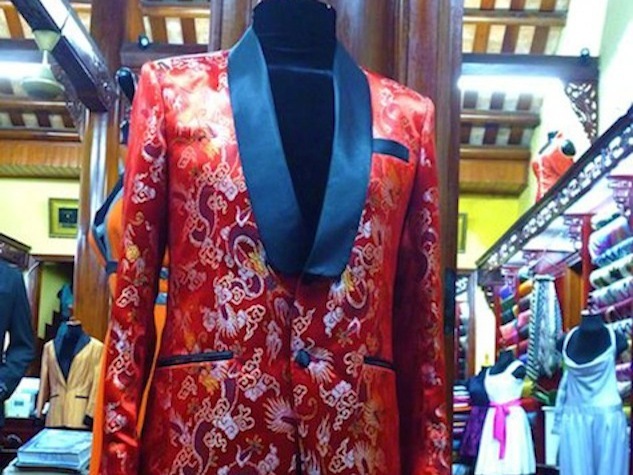 Vietnamese tailors will make to order. Over the years I have had several business suits made and lots of silk shirts. More recently I have gravitated to a favourite Tailor in Pham Ngu Lao St in Ho Chi Minh City where I have had everything from pyjamas, shirts, pants and suits tailor made. Although Hoi An is renowned for its Tailor made clothing I have found the Tailors there to be a little more expensive. Perhaps because Hoi An is such a popular tourist destination and the Tailor shops have more heads through the door, they are able to charge a little more. These are just a few ideas. When you arrive in Ho Chi Minh City you will find an Aladdin’s Cave of souvenirs at the Ben Thanh Market and Saigon Square or Hanoi’s Dong Xuan Market.